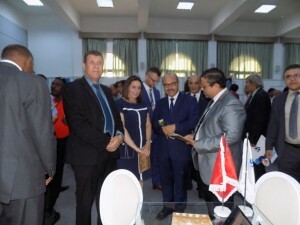 In the framework of the 52nd edition of the International Sfax Fair held from June 26 to July 10, 2018, under the high auspices of the president of republic and opened by the chief of government Mr. YOUSSEF CHAHED, the association of the fair of Sfax organized on Friday, June 29, 2018 a diplomatic day. This initiative aims to generate prospects for the participating enterprises and institutions and to inform their excellences the ambassadors and chief of diplomatic missions, guest of Sfax on the opportunities offered in terms of investments in Sfax in order to boost the partnership and economic corporation with these countries. The diplomatic day was opened by the first delegate Mr Abdelbaset MANSRI with the presence of the mayor of Sfax and the ambassadors, and the chef of diplomatic missions and different diplomatic delegations among them his excellency the ambassador of Palestine and his counterpart in Indonesia, Japan, Gabon, Burkina Faso and Serbia. Saudi Arabia, Sudan, France, Russia, Libya, Greece, India and the Democratic Republic of Congo. 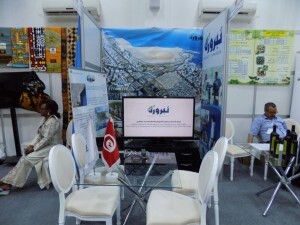 This event was an occasion for the Company for the Studies and Development of the Northern Coasts of the City of Sfax to promote the Taparura project in order to attract new investment opportunities by presenting its components and objectives both in its first phase dealing with depollution and rehabilitation of the North Coast of the city of Sfax and the second phase related to development of the new urban center .